We always give a lot of attention to the projector, which is the heart of the video system. 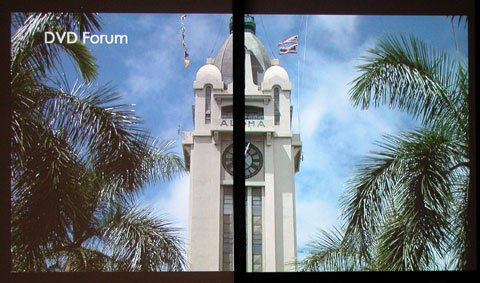 However, screens are the other half of the projection experience and they can have a real impact on the picture. With high quality video projectors now dipping below $1,000, a lot of people are looking for good, cost effective screens that fit the same budget. So we went out looking for screen products that you can get in a rigid, fixed frame, at a size of 100" diagonal 16:9 format, for under $500. We found several models that fit this criteria: Two screens from Elite, one from Saaria, one from Grandview, and the Goo Systems paint-on screen. Using a JVC DLA-RS2 as our projector for this review, we compared each of these products to our reference Stewart screens (a Studiotek 130 for white screens and a Grayhawk RS for gray screens) and to each other. We were looking for differences in color balance and light reflection, as well as other details such as ease of assembly and aesthetic appeal. Elite is a well known name in screens, with a reputation for quality products and reasonable prices. 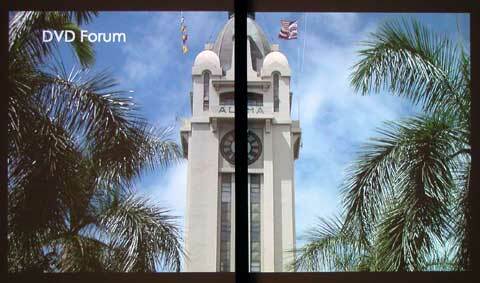 Our test samples included two 100" fixed frame screens, with one in white and one in gray. They came in smaller boxes than expected - it turns out that the long horizontal crossbar is actually two pieces which join in the middle. Unpacking was simple, so we started the clock and got to work. Construction. Our first screen of the day, the first Elite took 52 minutes for one person working alone to assemble completely, with most of that time being spent on attaching the screen to the frame. 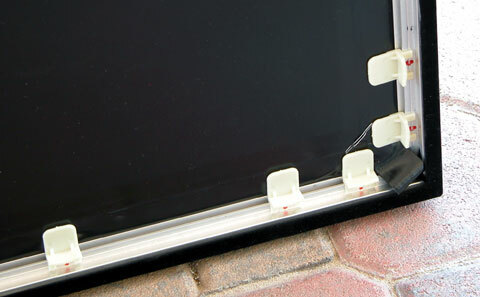 The Elite screens attach to their frames with a series of plastic tabs, as shown below, which must be inserted by hand. These are evenly spaced around the perimeter, with extra emphasis on the corners. After finishing one side of the screen, your thumbs will start to sting. The Elite screen attachment system. The instructions are very clear, and there's no need to worry about getting lost or confused if you actually read them. If you are handy with tools or have assembled a screen before, you can probably knock 15 to 20 minutes off of that time - our second Elite took only 37 minutes. The Elite screen was more difficult to assemble than the Grandview and Saaria, but this one-time effort pays off in terms of build quality. Build Quality/Screen Tension. In exchange for your hard work, you get a screen that is exceptionally well built, with an evenly tensioned smooth surface. There was not a wrinkle or flaw to be seen anywhere on the screen's surface. Aesthetically, the seam in the horizontal frame bars where the two pieces join is less than ideal, and the 2.44" velvet border looks too thin for a screen of this size, but these are minor complaints. Overall, the Elite EZ-Frame looks and feels like a solidly built piece of equipment. Performance. With the Elite white screen placed next to the Stewart Studiotek 130, two things become immediately apparent. First, the Elite White does not reflect as much light as the Studiotek, which measured 17% brighter. Second, the Elite White is slightly colder than the Studiotek 130. This can be corrected by altering the color balance of your projector, but there is a good chance that one would not even notice the shift without doing a side-by-side test. 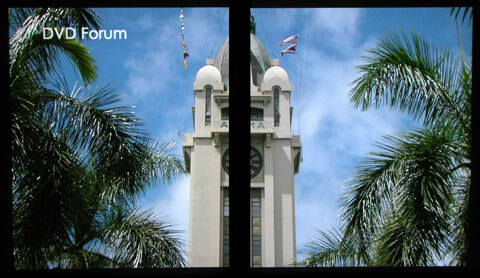 In the screen shot below, you can see the difference in brightness, and also the color shift--the sky on the left is bluer, and the surface of the building is a darker shade. Now, keep in mind that the Stewart Studiotek 130 is about four times the price of the Elite White. When putting the Elite up against another screen in the same price range, it competes quite well. 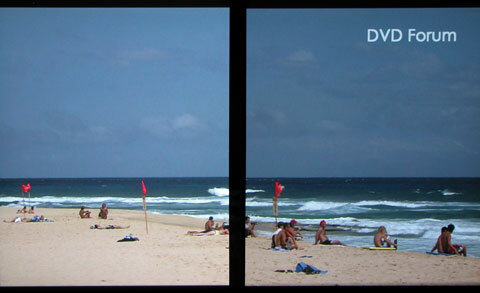 When viewed side by side with the Grandview White, there was no difference in brightness. However, there was a noticeable color temperature difference, with the Grandview appearing a bit colder than the Elite. The difference between the two was subtle, and difficult to discern in the following screen shot. Nevertheless, the Elite White is the warmer of the two screens. Overall. The Elite EZ-Frame White is a great value. Color balance is among the best in the group, and it performs fairly well against the Studiotek in terms of brightness for one-fourth the price. It's 2.44" wide frame is adequate for a 100" screen, but a 3.0" or 3.25" width would be ideal. However, Elite's 100" 16:9 EZ-Frame sells for roughly $420 through Elite's dealers, so you can't beat it for value. The Elite EZ-Frame Gray is structurally identical to the EZ-Frame White, so the Construction and Build Quality sections will be skipped. Elite's Gray screen will marginally enhance contrast on projectors that suffer from weak blacks or low contrast ratios (for high contrast projectors, Elite recommends the White). However, the image is not as bright. Notice that the Elite Gray screen, shown on the right, is darker than the Elite White on the left. Performance. The Elite Gray screen was tested against the Stewart Grayhawk RS, a gray screen designed to enhance black levels and color saturation. Against this screen, the Elite Gray showed similar results as the comparison between the Elite White and the Studiotek - the Gray was not quite as bright, and slightly colder, than the Grayhawk. This time, the difference in brightness was 22%, and the color shift towards blue was slightly more pronounced. Overall. Elite EZ-Frame Gray can be had for the same $420 as the EZ-Frame White. The bottom line here is that the Gray fabric will knock brightness down significantly, and whites will appear less brilliant while blacks will appear more solid. If you have a very bright projector that needs a contrast boost, the Elite Gray has what you need.